Many formulas in Excel contain references to other cells. These references allow formulas to dynamically update their contents. We can distinguish three types of cell references: relative, absolute and mixed. If cell A1 contains value 2, and cell B1 contains formula =A1+2 (referring to cell A1), then the formula B1 contains value 4. If you change the value in cell A1 to 5, then the value in cell B1 automatically changes to 7. If cell B1 refers to cell A1, then after copying cell B1 to cell D2, the cell starts to refer to cell C2. In other words, cell reference has been moved by the same distance as the copied cell. Look at the following example. Here, you can find the names of employees of a fictional company. 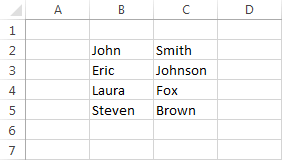 If you want to merge the first name with the last name and place them in column D, you don’t have to enter them manually, but you can merge them by using the relative references, instead. In this case, enter the formula =B2&” “&C2 into cell D2. It will merge cell B2, space, and cell C2. Now you can use AutoFill to fill the remaining cells. You can display formulas instead of values by using the Ctrl + (the key that is located below the ESC key) keyboard shortcut. As you can see, only the formula in cell D2 refers to cells B2 and C2. References in the next cells have been shifted accordingly. Absolute cell reference always points to the same place, even if you change the position of any of those cells. In other words, if you have cell A1 which refers to the contents of cell B1 (=$B$1) and then you change the position of A1 it will still refer to cell B1. If you drag cell B1 to another location, for example, B3, then A1 will point to the new location of the same cell (=$B$3). Look at the following example: it shows the earnings of Tom Smith. We need to calculate how much tax he needs to pay each month. Look at the formula bar. It shows how much tax John needs to pay for January (=C3*D7). If you want to automatically fill the remaining months, you will notice that for February the reference doesn't point to cell D7, instead, it points to cell D8, and for March to cell D9. To create an absolute reference, click cell D3, then in the formula click text D7. Now press the F4 key and confirm it by pressing Enter. This will change a relative reference to an absolute reference. 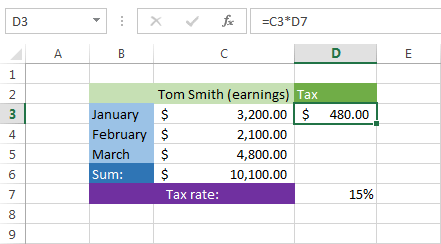 Use AutoFill to count the taxes for February, March, then sum all the months. Press Ctrl + to display the formula. As you can see in the example above in all four cells, the first part of the formula is a relative cell reference and the second part is an absolute cell reference. A mixed reference is a reference that refers to a specific row or column. For example, $A1 or A$1. If you want to create a mixed reference- press the F4 key on the formula bar two or three times depending on whether you want to refer to row or column. Press F4 one more time to go back to the relative cell reference.